When "Rerun build only for failed parts on the matrix" is checked but no children to rerun, naginator-plugin reruns whole the matrix. An aggregation process of the matrix is failed. The regular expression for logs doesn't match any children. I introduced a new configuration "When no combinations to rerun" in the "Advanced" section. Don't rerun a new build. I believe this feature is often used with the regular expression feature, and the field for the regular expression feature is also in "Advanced" section. Users don't miss this feature. This might be related to the problem in #27, and I want your review if you don't mind. I especially want you review for whether the feature and help texts are clear and easy to understand for users. Thank you for this pull request! Please check this document for how the Jenkins project handles pull requests. Thanks for that notification. Really thank you for letting me review the feature. I have three matrix jobs A, B and C.
In the configuration you describe I cant see how I can get to my needed functionality. Was this ever an indented configuration. I would appreciate to have it working like this. 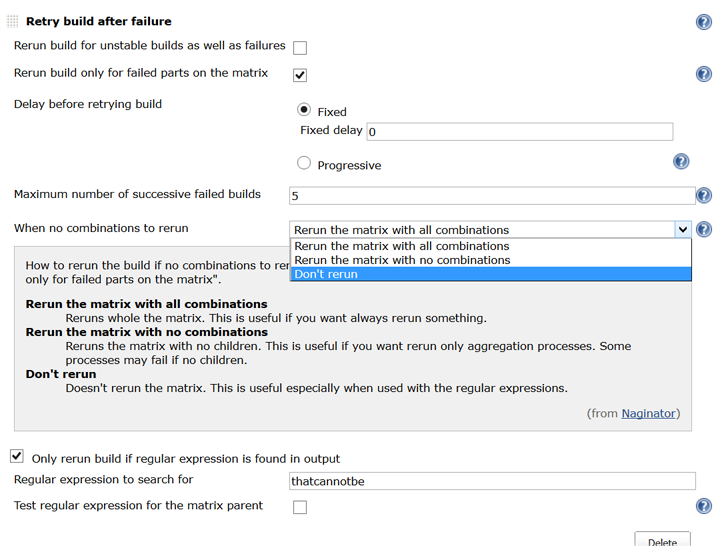 Solution: In the select I would add another option like "Rerun the matrix with all failed child-builds" with the help text "Reruns all failed child-build of the matrix, not considering whether it matches the regex or not." Apply to the child builds to decide to trigger the matrix. Apply to the child builds to filter combinations to trigger. Apply to the parent build. Let me have some more time to work. …ar expression to matrix" which replaces "Test regular expression for the matrix parent"
Introduced "How to apply the regular expression to matrix". Though this change is rather for #30, it will conflicts with this request and I decided to continue in this request. Would you review the additional change? The changes in code have got complicated and might be difficult to review. I want you see the screenshots and new texts in Messages.properties, and I want your comments for the new feature. This is a case described by @mjainta . axis1=value1 and axis1=value3 failed, regexp matched axis1=value1, and retriggers both axis1=value1 and axis1=value3. They are MessageFormat strings and single quotes are treated as escaping characters. You have to write '' to represent '. So thats the case I described in the ticket I guess. That's the new feature for cases you described. [JENKINS-32823] [FIXED JENKINS-32821] Added "When no combinations to rerun" and "How to apply the regular expression to matrix"